Twitter doesn’t seem to be too fond of the police. Or conservatives defending them. A former Portland mayoral candidate, Sarah Iannarone, tweeted her condemnation of the police after an incident where a man was shot and killed by the police. A former Portland mayoral candidate, Sarah Iannarone, tweeted her condemnation of the police after an incident where a man was shot and killed by the police. On Wednesday, the White House took the historic step to involve four journalists from outside Washington D.C. in the Daily Press Briefing, but it didn’t sit well with many establishment media types inside the Beltway and New York City who complained they were too soft for their liking. No wonder this guy professes love for President Obama: neither one cares how much the government spends . 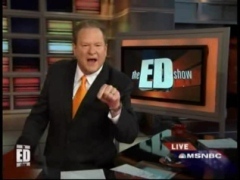 . .
Ed Schultz debuted his MSNBC show this evening by calling for universal health care, saying "I don't care how much it costs." There was one area, however, in which Schultz did show more guts than his new colleague, Keith Olbermann. On Tuesday, liberal talk radio host Stephanie Miller called Rush Limbaugh's now well-publicized statement about wanting Barack Obama to fail "treasonous," and wondered if he should be executed for saying such a thing. Miller made this rather provocative comment on CNN's "Larry King Live," and oddly nobody batted an eye or seemed at all put off by it. Want to know just how in the tank MSNBC's Dan Abrams is for Barack Obama? On Thursday's "Verdict," the network's former general manager actually tried to deflect criticism from Michelle Obama by bringing up statements John McCain made concerning his experience as a Vietnam POW making him realize how much he loves America. This is how Abrams began the program: "Tonight: We have uncovered comments from John McCain on camera that could undermine the steady right-wing attacks against Michelle Obama." Is that Abrams' role as a journalist: to undermine attacks against the wife of a presidential candidate?